here in the U.K., so it is a busy and exciting time for Germein. 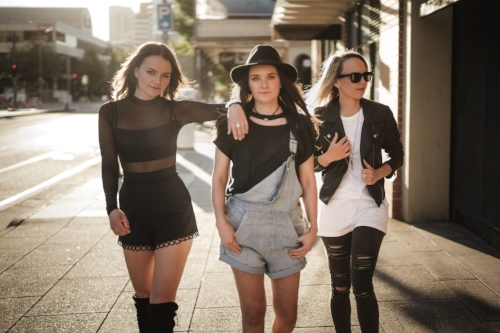 The Australian sisters discuss playing with Little Mix and being in Britain; self-producing their latest track, Talking, and what its story is – the group tell me about their influences and what the music scene is like where they live in Adelaide. I ask them which artists and albums mean a lot to them; if they get time away from music to unwind and chill; what advice they would provide to artists coming through at the moment – Germein highlight a new act to look out for and choose a few songs to end the interview with. Hi, Germein. How are you? How has your week been? G’day! We are fantastic, thank you! Our week has been crazy-amazing. We are in the middle of a U.K. stadium tour with Little Mix and having the best time. We’re a sibling Indie-Rock pop band from Australia. Georgia plays guitar & keys, Ella plays bass & electric cello and Clara plays drums. You are all sisters. When did you decide to make music together? Did you share music tastes growing up? Clara Germein: We started out jamming together on our family farm in the Adelaide Hills, South Australia - putting on little shows for our grandparents and family friends when they’d come to visit. Playing music was always something fun we loved to do together. The first C.D.s we ever got were Celine Dion (Georgia), Shania Twain (Ella) and Kate Cebrano (Clara) - which we listened to on-repeat! Georgia Germein: Our dad played the trumpet in a New Orleans Rhythm and Blues-style band and introduced us to artists like Ella Fitzgerald, Louis Armstrong; Van Morrison, and Cat Stevens. We grew up going to his shows, which was always very load, energetic and lots of fun. Mum played Classical and Folk music around the house and we were encouraged to have fun and be creative with our music. We sang Ella Fitzgerald’s A Tisket, A Tasket for our first public performance, I think, when I was about six-years-old! Ella Germein: We didn't watch much TV growing up but, when we did, it was usually Disney movies which, of course, are known for their amazing soundtracks. I think these definitely sparked our interest in the power of music and emotion. Talking is your new single. Can you reveal the story behind it? Georgia: Talking takes on a bit of a darker theme with edgy guitar hits, pumping drums and bass - and a soaring break-out chorus showcasing our three-part harmonies. Talking, we hope, can relate to people facing all different types of challenges. Whether it be feeling like you can't express yourself through communication in a break-up, losing a loved one; fighting with a friend or even not feeling like you have the right to talk – which, unfortunately, is true for many people in this world. Ella: There’s a line in the song, “This silence is killing us”, which, basically, talks about bottling up the fear, anger and frustration to the point of it feeling like its destroying you. There is a cool build-up in this part of the song which sort of reflects that building up and exploding feeling; like that feeling when you stand on the edge of a cliff and just scream out, releasing all the emotions, and after you feel ten times better. Is it true this is the first single you produced yourself? Did you feel the need to have more control and say? Georgia: Yeah. We decided we wanted to start making music on our own terms and so I tried recording and producing Talking myself in our home studio in the Adelaide Hills, South Australia. I’ve always been recording demos and messing with recording gear over the years, so it’s been quite empowering to finally get to the point where I can do it myself. We wanted Talking to sound like ‘us’ and I think we were best able to capture this by producing it ourselves. Talking was pre-produced by Stuart Gray and mixed by John Castle. When we hit ‘play’ on it, we knew it was the musical vision we’ve had for ourselves finally coming to life. Looking ahead; might there be an E.P. or album coming along? Yeah. We’ve got a bunch more songs coming out soon, so stay tuned! Being based out of Adelaide; what is the music scene like there? How does it compare to other parts of Australia? Adelaide’s music scene was our first taste of life in the industry, sparking our huge love for live music and performing. There are lots of great festivals in Adelaide, such as the Adelaide Fringe, which has been named the biggest arts festival in the Southern Hemisphere. There’s also WOMADelaide and Oz Asia, attracting thousands of people to the city to experience the wide variety of music from many different cultures. The Porch Sessions are well-known for transforming backyards into an intimate musical oasis - as well as A Day on the Green, Handpicked and Botanic Park for larger outdoor festivals in picturesque locations such as renowned Adelaide Hills Wineries and Adelaide’s beautiful Botanical Gardens. 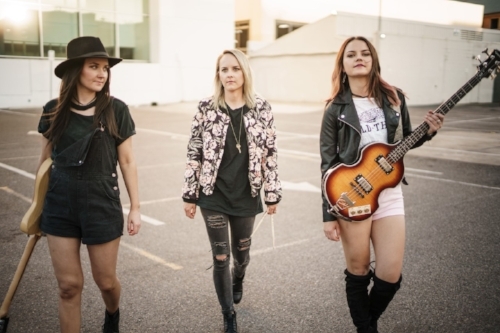 You will always find live music in the city anywhere; from the bustling Adelaide Central Markets to the busy streets of Rundle Mall and even as you go to collect your bags at Adelaide Airport there’ll be local muso welcoming you with their tunes. Adelaide was also recently named as a UNESCO City of Music (one of thirty-one cities in the world), which is awarded to cities that have demonstrated excellence in music heritage, music-making; education, community involvement and regular high-profile international music events. Other great Aussie cities for music include Sydney, Melbourne and Brisbane. What might one find if they searched your music collections? Do you all have quite a wide range of heroes and heroines? Ella: We love bands with a strong harmony feel like Fleetwood Mac and Queen; the edginess of Florence and the Machine and The Wombats; plus, the fun energy of iconic female artists from over the years like the Spice Girls, Beyoncé and, of course, Little Mix. I just love everything about a live album - and John Mayer’s songs and musicianship are just incredible. I'm obsessed with this new album of hers. I don't know what it is but it’s just so beautiful the way it's been written and musically created. I just love it. We do a lot of driving on tour and it’s great driving music. The songs are catchy and feel-good too. Georgia: Arriving at the point of being able to record our own songs ourselves in our home studio. I love the process of recording a new song in the studio and to be able to create something new, add layers and give it personality and heart in my own time is so rewarding. It just makes me even more excited to be able to share these new songs with the rest of the world. Ella: Playing for the orphans and sick children at the Agent Orange Rehabilitation Centre in Vietnam. It was such a heart-warming experience. Clara: I just love touring in general. Being able to travel the world and play our own music is such an amazing feeling. If you could each support any musician alive today, and choose your own rider, what would that entail? Rider: some puppies to play with. Have a love of music at the heart of everything you do; create opportunities for yourself to get experience in the industry; don’t be afraid to ask questions - and be yourself. I believe you are playing dates in the U.K. Which venue/date are you most looking forward to? We are genuinely excited about every venue we are playing at in the U.K.! This is our first time playing in stadiums, so it’s quite surreal! You are supporting Little Mix. Have you met them before? Are you excited about playing with them?! Ella: We had the best time opening for a couple of Little Mix shows last year, so it’s incredible to be invited to back to play fifteen arena shows on their Summer Hits Tour in 2018! They are such a talented and down-to-earth group of girls who are smashing it in the music world at the moment, so we are stoked to be touring with them this July. Rak-Su is a great group of fellas who are also touring with Little Mix, so we recommend you check them out! We mostly unwind by going for a walk or a run, listening to music or watching a movie. Georgia unwinds by playing music or reading; Ella likes to paint and Clara likes taking our dogs for a walk. In Australia, we all like going to the beach and, if there’s time, going surfing.